Lee Bernard was born on March 5, 1923. His father, Henry Bernard, Sr., was a section foreman for Southern Pacific, and his mother, Bernadette Bernard, was a housewife. Lee is a World War II veteran having served as a tank operator in the 739th Tank Battalion. 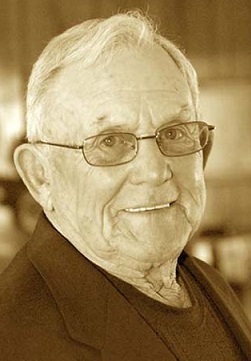 He graduated from Erath High School in 1941 where he excelled in baseball and basketball. In 1946, after returning from the war, Bernard helped organize the first Erath Volunteer Fire Department and served from 1946-1952 as its first fire chief. Lee worked for Texaco for 10 years before he was laid off and then operated the Canal Service Station in Erath for 15 years. It was here at the Canal Station in Erath that the legendary D.L. Menard wrote his classic song “The Back Door” while pumping gas for Bernard. In the 1940s, Bernard began a long association with the Civil Defense Department. Through his association with Civil Defense, Lee was able to purchase the town’s first fire truck and a generator for the town to use in emergencies. He was there in 1940 when the town of Erath, and all of South Louisiana, flooded, and he was there assisting the Civil Defense workers when Hurricane Hilda slammed into Erath, toppling the water tower and killing 8 Civil Defense volunteers. It was Lee Bernard who successfully convinced community leaders to dedicate the new city hall to the memory of the eight citizens who perished in that disaster. He has also been very helpful in supporting Bares Ranch, a facility for handicapped individuals within the community, and has dedicated his entire life to assisting the public school system whether it be in academics or in sports. To this day he is still a loyal and dedicated supporter of Erath High Athletics. Lee Bernard is a prime example of a dedicated and loyal citizen. His smiling face and helping hands are just two reasons why he is so beloved in the community. From 1987 to 1997, Lee volunteered to serve as crossing guard for both Dozier Elementary and Erath Middle School, making sure the children were safe at all times. For all of his civic contributions, Lee Bernard was selected as Grand Marshall of the 1998 Erath Fourth of July Parade. Currently, Lee Bernard is the subject of a historical documentary being produced by Louisiana Public Broadcasting and independent film producer Pat Mire. "Mon Cher Camarade" highlights his experiences during WWII, and his and other Cajun soldiers' ability to speak fluent French, which provided the U.S. Army’s most effective means of communication with local authorities and the civilian population, and which, in turn, provided critical support and intelligence to the American army. Lee is married to the former Vella Mae Comeaux and has two children, Shelby and Deanna, six grandchildren and three great-grandchildren.